I've been pretty sure for a while that I prefer draft beer to bottled -- it sometimes seems to me that beer loses some flavor in the bottling process -- but I've never tried the same beer side-by-side from bottle and keg. Until now. Over the weekend we had a keg of Deschutes Jubelale at a party, and I decided to do a blind tasting of the draft vs. bottles. This was in a pretty casual atmosphere, and lately my blind-tasting skills have been questionable. In this case I didn't take very good notes about peoples' preferences between the bottled and kegged samples, though most people seemed to find the draft Jubelale to be mellower. Personally I found the bottles showed more of this year's "tannic" harshness decried by Jeff and Pete. I actually like this year's stronger taste -- it seems to me to come from extra hop bitterness or maybe some darker malts -- but it was more muted and easier to approach on tap. In my jubilant mood, the silly thing I focused on in the blind tasting was whether people could guess which glass had beer from the keg and which from the bottle. Almost universally, people guessed wrong, including myself. Ritch Marvin got the question right, and Brian and Bryce might have also, but there was some possibility that their samples were swapped (those questionable skills of mine at work again). Which was better, tap or bottle? In this case they were nearly identical, though I still think the draft Jubelale was infinitesimally better. There was much less of a difference than I expected, which makes me wonder if my bias is wrong, or if it is based on some other factor like out-of-date bottles. Labels: blind tasting, conventional wisdom, deschutes, vs.
Last weekend I had some draft Anchor Steam Christmas Ale and it was fabulous. Then I bought a six pack and it didn't even taste like the same beer. Hmmmm. Wish I was out west so I could have some draft Deschutes Jubilee. Enjoy! Bill, I thought the draft tasted like it had more age on it than the bottle. The hops seemed to have dropped out and it was more malt forward. I also detected what I thought was a slight bit of diacetyl in the keg version and a bit of metallic flavor. I preferred the bottle version's crisp hop bitterness that balanced the malt sweetness of the beer. I don't know if you still have some of the keg left, but you'll have to let me know if it gets buttery. Ritch: There's plenty left in the keg; it's over in Dave's kegerator now. But I think you're insane for thinking there's diacetyl in this year's Jubelale; I sure don't taste it. And if it was there, what would make the diacetyl increase over time? I've thought about this question a lot lately, and I think I've decided: What makes us think draft is better is that we always drink draft from a glass. Beer always tastes better from the open pouring area of a glass than from the narrow hole of a bottle. It hits your palate better and more broadly from the glass. At home, I never drink directly from a bottle — I always pour it into a glass, and I think it tastes as good as draft. But I have no empirical data on which to base this opinion — it's just shoot from the hip conjecture. But it make sense: After all, the beer all comes from the same brewing facilities, right? Sometimes some of the specialty malts will give off a toffee, caramel flavor that can taste like a hint of diacetyl, but I only noticed it in the keg. If the diacetyl is from a infection, it usually gets stronger over time. Here's what you do, take a sample, warm it up (20 minutes in a hot water bath), cool it down in a cold water bath, then smell it and taste it. Bill, this is a worthy study, bit I think you need a much larger sample size. My guess is that some beers will taste better bottled, some kegged. Those with more delicate, fleeting flavors will definitely do better on keg--unless you are lucky enough to score a really fresh bottle. Bigger, rounder beers like many Belgians will probably do as well or better in te bottle. Another factor is bottle conditioning. Lee: 99% of the time I pour bottles into a glass. So my belief was that a glass of beer from a tap was usually tastier than a glass from a bottle. Ritch: I'll try that soon. I always thought of diacetyl problems as coming from not giving the yeast enough time to reabsorb it, so I had to look up diacetyl to see what you were talking about. You are thinking there is a bacterial infection in the keg? Jeff: It definitely merits a more careful look. I've been thinking for a while I'd try it with three beers or so sometime, maybe set up a blind test at Beermongers. It just happened that I had the keg and bottles last weekend -- and I actually thought I had another matchup, but couldn't find any bottles to match the second keg -- so I went for it. Bill: Some of your bottles of Jubelale seemed a bit old. Maybe you should rotate your stock more often. Dave, I will give you as many bottles of 2004 Jubelale as you want, if that helps rotate the stock. 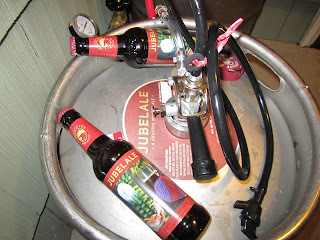 I tasted a draft version of this year's Jubelale over at Belmont Station the other night. It was much smoother than the bottled version. Even the Super Jubel served at the Holiday Ale Festival was smoother than the bottled version. My opinion remains the same: 2011 Jubel in a bottle will taste better with a bit of cellar time...though folks who like harsher winter beers may like it fine just the way it is.